U.S. Army Special Forces personnel served in Vietnam between 1957 and 1973. 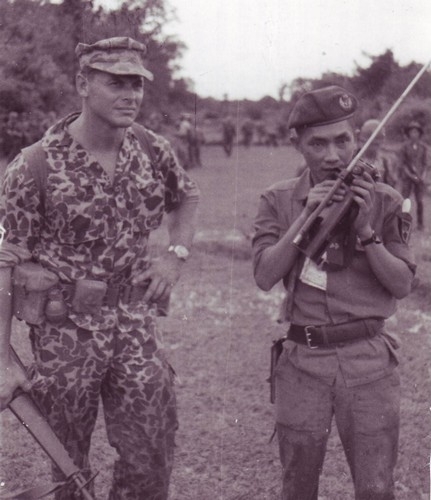 Initially restricted to training their South Vietnamese counterparts, Luc Luong Dac Biet (LLDB), in late 1961 Special Forces were also tasked with developing the Civilian Irregular Defense Group among the Montagnard tribesman in the central highlands. Though it began as a village defense system, from 1964 the CIDG program's focus shifted towards border surveillance. Camps were built along the Laos and Cambodian borders, from which SF and CIDG strike teams launched missions to detect and interdict enemy infiltration routes. Following the introduction of conventional American combat units in 1965 the need for accurate intelligence on Viet Cong / North Vietnamese Army movements increased. Consequently Special Forces and specially trained CIDG troops began undertaking unconventional operations, including long range reconnaissance patrols and mobile guerilla actions in enemy controlled areas. U.S. Army Special Forces also provided most of the personnel for the highly classified cross-border reconnaissance teams operated by SOG.